Downcast, Doubting, and Discouraged? Fill Up With the Prophetic Word NOW! Beloveds, have you been in a dark place? Have you been in a place of despair, where you’ve been tempted or fallen into doubt, unbelief, and self-pity? If so, I believe this is an urgent message from Holy Spirit: you must fill up with God’s prophetic word of hope NOW. I never used to realize how incredibly, vitally important God’s prophetic words were. I mean, I always loved to hear the prophetic word. But I didn’t really get how crucial it is to have a consistent stream of accurate, encouraging prophecy flowing into your life. But then I looked up a particular Scripture, and I was in shock. You know that verse about “So then faith comes by hearing, and hearing by the word of God” (Romans 10:17)? Well, I always thought that verse meant that, in order to bolster our ability to hear God (and therefore our faith), we need to fill up on studying God’s Word. His logos (“logos” being the Greek word for the written Word of God, and also for Jesus when He’s called the Word). And I never looked it up to see if that’s really what it means–until recently! When I did, though, I was shocked. You know what I found? I found that, when it says “Faith comes by hearing, and hearing by the word of God”–that the Greek “word” isn’t “logos” after all! The word of God that builds your faith is not logos at all. It’s rhema! Rhema! What is rhema? “Rhema” is the right-now, on-time, fitly-spoken, prophetic word of God! When you’re in a crisis of faith, God says you need to fill up on His prophetic word! Why? Because God’s prophetic word–His rhema–is always encouraging! The purpose of prophecy is to edify, build up, strength, equip, and encourage. The prophetic word always speaks comfort directly to the deepest needs of your heart! By the way, on December 3 (tomorrow!) and December 13, I’ll be teaching webinars to equip YOU to function in reliable, safe, accurate prophetic ministry–and how to discern and stay away from unreliable prophetic ministry! Click here for more info about Intro to Prophetic Ministry 101 and to sign up! A video replay will be sent to all registrants who aren’t able to attend in person, but only if you register! 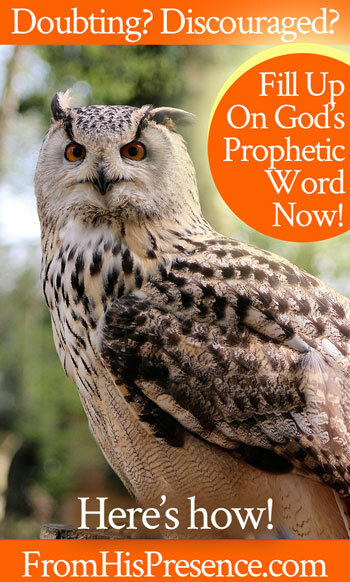 Do you need God’s prophetic word today? I know I do, and God has been speaking His rhema to me in the sweetest ways. The last few days, when I’ve sat down with my Bible to study in the mornings, Holy Spirit has been prompting me to go to certain passages and chapters that I haven’t read in awhile–chapters from Isaiah (Isaiah 49, 60, 61, and 62, to be precise–as well as Psalm 37). He started talking to me about some of the deepest concerns of my heart–things that I was trying to put aside and leave in His hands; things I had no intention of praying about in that moment. But Father saw the deep desires of my heart and wanted to talk with me about them. He gave me a prophetic mandate, showing me what He has been doing with me during some hard times, and telling me how to act going forward. He even gave me encouraging words to share with others who were going through similar situations! And when I began reading these chapters that are specifically God’s prophetic words for us, it was like water for my soul. Like meat for the hungry starving famished. Like new life for the decrepit of spirit. God’s prophetic word pulled me out of just trying to survive and fend off the pain. He filled me with faith that the hard times are nothing in comparison with what He is doing and about to do. I mean, I’ve always known God has plans for me that are good. But sometimes when you go through hell, it can be hard to imagine that the hell can stop and good can happen to you! again. But that’s exactly what God’s prophetic word brought me: hope and joy and FAITH and courage and JOY, joy, and joy again. And doubt and unbelief are sin, no doubt about it. God’s Word says that whatever is not of faith is sin (Romans 14:23). And all throughout Scripture, God says over and over that doubt and unbelief are very offensive to Him. So how can we stay in faith? We stay in faith by filling up on God’s prophetic word. Depending on where you are and what your situation is, all of the methods below can work. Just be sure you are ONLY looking to God and godly things for His Word, NOT ever any occultish source like psychics or mind-reading, okay? Those things are demonic and will open the door to the enemy to wreck your life. Stay AWAY from the demonic and the occult! Go to God and ONLY use His methods to hear from Him! Method 1: You can get a prophetic word directly out of God’s written Word. … and the whole thing comes together. Right out of God’s Word, His logos. But it wasn’t the fact that it was logos that builds my faith. It’s the fact that it’s rhema that builds my faith. Because if He doesn’t make those Scriptures jump off the page at me, then I may not get what He’s trying to tell me at all. And if I don’t hear those on-time, right-now, fitly-spoken words from Holy Spirit, the level of faith, hope, joy, comfort, and encouragement I have when I go out of my study time is nowhere near what it is when He speaks His rhema to me. Method 2: Get a prophetic word through prayer. This is a conversation I’ve been having with a friend lately, so I want to talk about it because maybe more than one person is thinking about this. Beloveds, I’m being careful to tell you here to get a prophetic word through prayer, Bible study, and your own research (see method #3). Why? Because you’ve got to take responsibility for your own life and your own walk with God. If they have a word for you, listen. If it resonates with you and it lines up with God’s Word, receive it. God is using them to bless you. When they encourage you, listen. If it lines up with the Word, receive it. God is using them to bless you. When they offer to pray for you, it’d be good to let them. Not because you can’t pray on your own; you should have already prayed. But if the person prophesying to you has had breakthrough in the area they’re praying about, they have gained a place of authority in intercession over that area, and they’ll get breakthrough without your having to fight for it because they’ve already won it in previous battles. That’s just how intercession works. Take everything your prophets say to you to the Lord, just like you should with everything else. Make sure that their words line up with His Word. But as long as they do, know that God sent you those prophets to be a blessing to you. Listen to them! But you can’t allow them to be your first source. GOD has to be your go-to source. So do you need a prophetic word today? Method #2 is to go to God and pray about it until you have peace and an answer. … and make sure the answer that you “know” you’ve heard lines up with His Word, and fills you with the fruit of the Spirit (love, joy, peace, patience, gentleness, goodness, meekness, self-control, etc). If it doesn’t, then the answer you heard was NOT from God, and you need to go back to the drawing board and pray again. If you’ll pray about your concerns, fears, struggles, and every type of situation, God will hear you and answer. And before you even see the direct answer to your prayer manifested in your life, you’ll have an answer from Him that He has spoken into your spirit, telling you what He is going to do. That answer in your spirit is rhema. It’s the prophetic word. Method 3: Keep up with prophetic news sources, to hear what God’s prophets are saying around the world. The words posted on Spirit Fuel and The Elijah List have been vetted, and they’re from reliable prophetic voices. Although I take every word I read to the Lord and ask Him if it’s true or not (as you should too), I consider both to be extremely accurate sources of prophetic words from the Lord, and they are very encouraging to me. God’s just cool like that. So rhema. God’s prophetic word. THAT’s the word of God that builds faith. So what do you need to do if your faith is waning–if you’re tired or discouraged? Fill up on God’s prophetic word right now. Right now. Run, don’t walk, to dine on His rhema. RUN. His prophetic word will fill you with hope and courage. It will renew your faith and re-kindle your joy, and it will give you inspiration to press on with a tremendous sense of expectation about what GOD–God, not the enemy–is doing in your life. Does this message speak to your heart today? If so, please leave a comment below! Word in season Thank you. So glad Abba Father encouraged you, sis. I’m still praying for you. I really believe we’re all going through the same stuff at mostly the same times, Nicola, so I do try to be transparent. Our specific circumstances are unique to us as individuals, but I think God teaches the Body of Christ the same lessons across the board. Another reason we need to cling together. Laurna, I hate that you’ve been hemmed in like that, but I’m thrilled that Father gave you wisdom and showed you a plan to move forward. I’ve been seeing lately across the Body that sometimes it’s actually been Father allowing us to be hemmed in sometimes, because then He shows us a way we never would have been willing to consider had we been able to move forward the way we originally wanted to. I don’t know if this is your situation or not, of course, but it has been mine of late. If it is, I pray Father would direct your steps so clearly and help you see the window He wants you to crawl out of when doors appear closed. Thank you, Jamie. I believe your reply is insightful and fits our situation. Seldom does God give me a road map. It’s more like a treasure hunt where I get clues. If I can figure out how to get from A to B, there will be another clue that shows me where C is, and it might not be anything I could have guessed while I was still trapped in the fog of A. By the time I get to D, I see the fulfillment of a vision received from point B that assures me I am on the right path so the leap to E isn’t quite so scary. I believe that is how we KNOW there is a God guiding us and that we are not merely “wise in our own conceits” (which means “concepts” not “pride,” although pride, too). As you prophesied a few months ago, we are in a time of restoration and fulfillment. But that doesn’t mean it will arrive like the Reader’s Digest Sweepstakes with a huge check, big hugs, and we run off to spend the money any way that amuses us. We are still in the solemn and joyous business of Kingdom building. I found the reference missing in my reply. I enjoyed this email today. God is really using you. I am so glad I found you. Please help me to understand God rhema word that he is giving me. When I get in his present I start thinking about so many things. I had a brain tumor a few years ago. But God has healed me. It just take me some time to relax my mind. Please keep me in your prayers. I thank you so much. Father, give wisdom to my sister Millie, and show her which steps to take in everything she is dealing with. I pray You would bring her forth shining like gold when she is tried, and let her radiate with Your goodness, glory, graciousness, and strength. In Jesus’ name. I thank you so much. Be bless. Rhema, yes that’s a word fitly spoken as the Proverb says. That is definitely why Jesus was able to accomplish what God sent Him to do, He heard and did what the Father said to overcome His humanity. This was such a great post. I’ve received some really big prophetic words from folks that operate in the prophetic, but I’m still waiting for confirmation from the Lord. I have trouble hearing Him some times. But either way … Father, give my sister Kathy wisdom to know if these words are from You. If they are, then use Your own written Word to confirm them in her spirit as she studies Your Word and spends time adoring You. In Jesus’ name. Thank you so much for your reply and your prayer! It could be that I’m just not spending enough quiet time daily in the Word and in prayer. Sometimes I pray about a question or direction and I just feel like I am not getting an answer. Perhaps I need to be more patient! P.S. I attended your webinar today, Prophetic Ministry 101, and I was so moved by you and the wisdom you shared. I will definitely attend future ones! So glad Papa blessed you! Thank you for reading, Tracy! Ah Jamie, what a blessing you are! In my praying and searching Father for direction and answers He led me straight to you today through an Elijah List email. 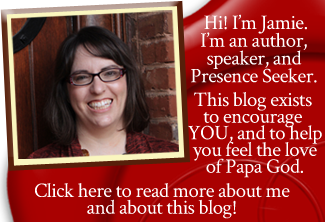 I read the artical, your website, your profile…..actually everything I could find about you and BY you ! (No, I’m not psychotic. A little on the weird side most days, but what can I say. ) Anyway, I’ve been so needful of a confirmation from outside myself, so I’ll know for sure I’m hearing the Holy Spirit and not just what I want to hear, and your words were so timely and accurate. Thanks. You and I actually have SO MUCH in common, but I think Father knew I needed something comforting right now, and that seemed to be the ticket. Keep doing what you’re doing! I look forward to reading more! Hi Jamie, Thank you for this word today. May you be bless.